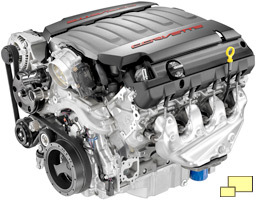 Along with the completely redesigned C7, an all new V8 engine, featuring the designation "LT1" was introduced. The LT1 nameplate was first seen on a special series of solid lifter LT-1 (note the hyphen) high performance engines available in 1970, 1971 and 1972 Corvettes. 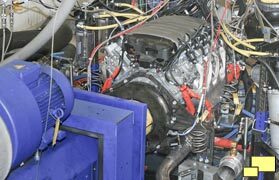 The new engine was the fifth generation of what the automotive enthusiast world has come to know and love as the "Small Block Chevy" of which over 100,000,000 have been built. First available in 1955, the "Gen 5" shares a few characteristics with it's seemingly ancient compadre: A V8 configuration, two valves per cylinder, a single camshaft located in the middle of the block and 4.40 inch cylinder bore centers. Designated as a 6.2 liter, the displacement is 376 cubic inches / 6162 cc. 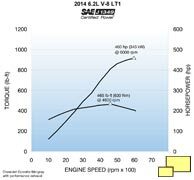 Bore is 4.06 inches (103.25 mm) and stroke is 3.62 inches (92 mm), the same as that on the 2013 standard issue C6 Corvette. Both the block and the cylinder heads are made of cast aluminum. 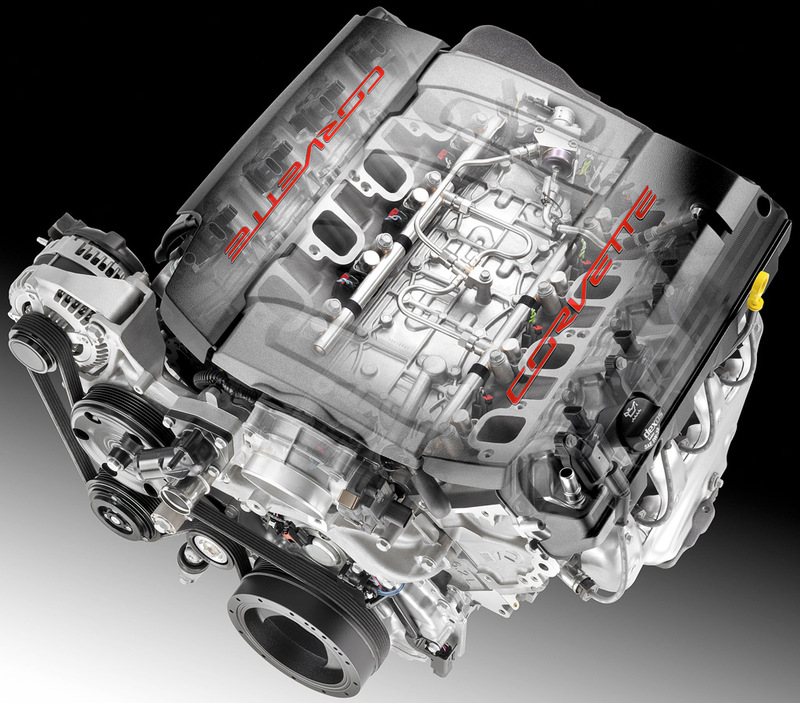 DI made its debut on the C7 Corvette motor. 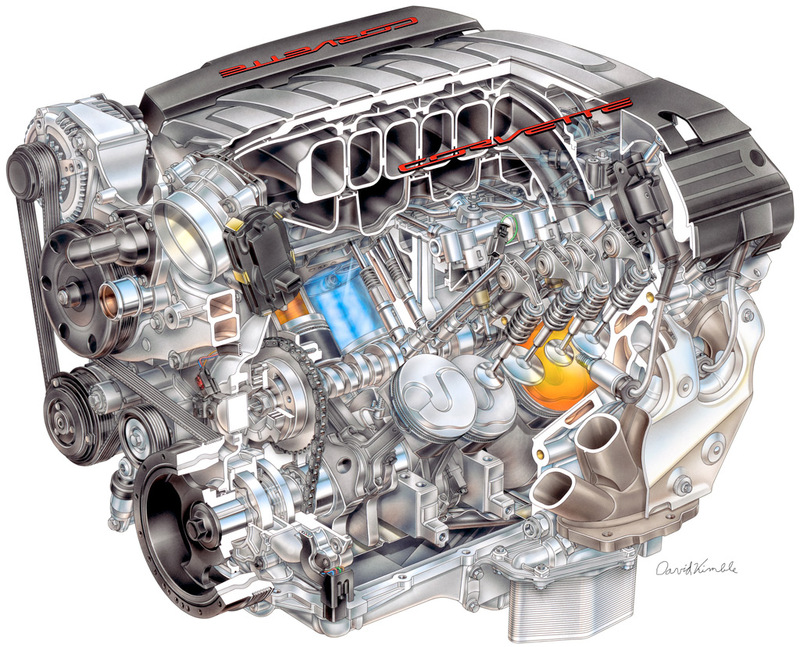 The technique injects fuel directly into the combustion chamber as opposed to the valve chamber as in previous generation Corvette motors, a technique that allowed the compression ratio to be raised to 11.5:1; previously it was 10.7. It is largely responsible for the significant gains in fuel economy as well as horsepower. Direct injection also keeps the combustion chamber cooler, which allows for a higher compression ratio. Emissions are lower, including the all-important cold start hydrocarbons which was cut by 25%. Fuel economy is kept under control by shutting down four of the cylinders during subdued driving conditions, turning the LT1 6.2 L V8 into a 3.1 L V4. Cylinder shutdown is accomplished by deactivating the lifters in cylinders 1, 4, 5 and 6. V4 operation, in the case of manual transmission C7 Corvettes, is only available in the Eco mode. Output is a meager 125 horsepower. 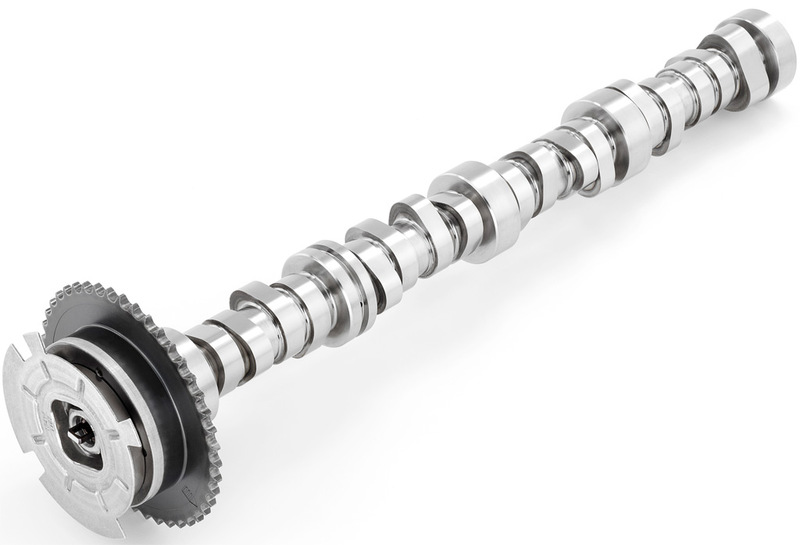 The LT1 camshaft is in the same position as that found in the original small block motor introduced in 1955 - in the center of the block. 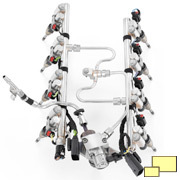 The new complex camshaft supports variable valve timing, giving the LT1 engine three camshaft profiles to choose from. The result is increased performance and fuel economy along with reduced emissions. It also drives the engine-mounted direct injection high-pressure fuel pump, which powers the direct-injection combustion system. 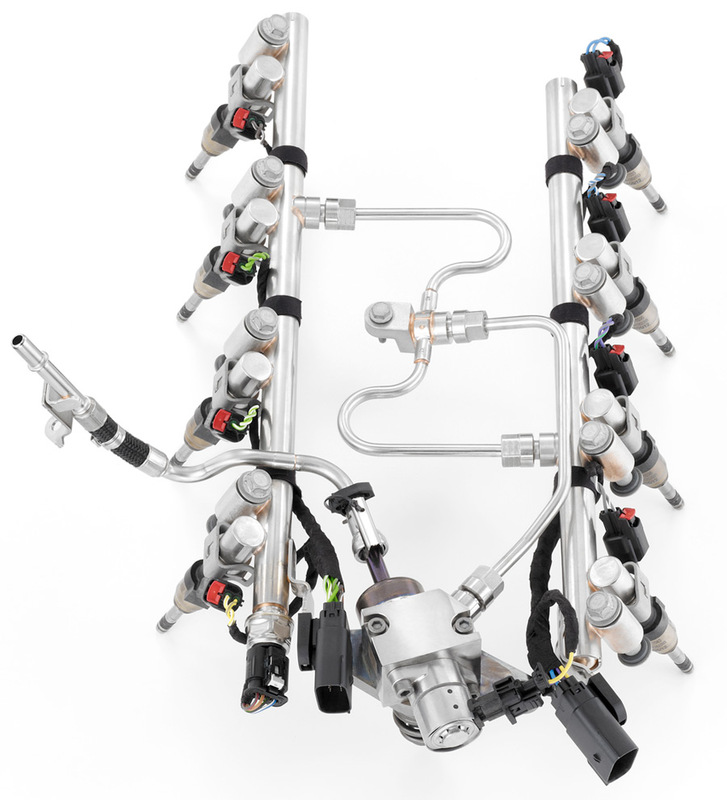 The cam’s specifications include 14mm/13.3mm intake/exhaust lift, 200/207-crank angle degrees intake/exhaust duration at 1.3mm tappet lift and a 116.5-degree cam angle lobe separation. 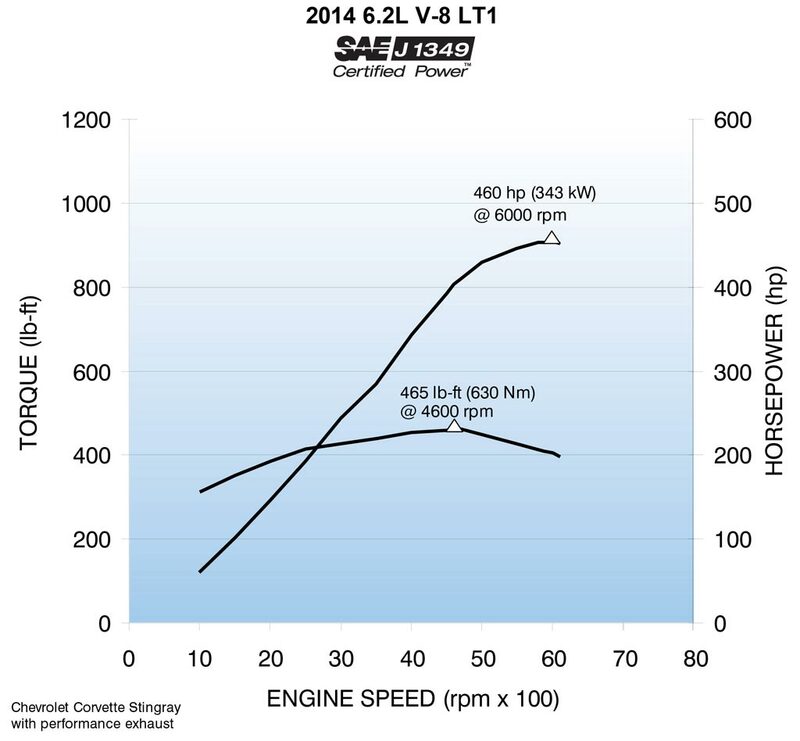 Horsepower is 460 @ 6,000 RPM, Torque is 465 lb-ft @ 4,600 RPM (Dual mode performance exhaust included, RPO NPP). Max RPM is 6,600 RPM; go beyond and an automatic fuel cutoff comes into effect. 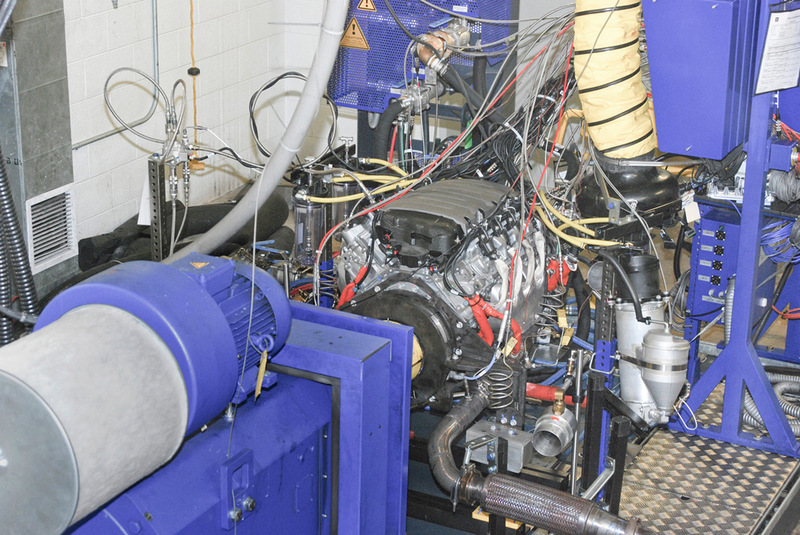 Left: LT1 engine on the dynamometer. The 2014 Corvette has been rated by the EPA as getting 16 mpg city / 28 mpg highway / combined 20 mpg (automatic transmission) and 17 mpg city / 29 mpg highway / combined 21 mpg (manual transmission). Premium unleaded fuel is required. Like every Corvette (except for the 2009 thru 2013 ZR1) since the rating system was implemented, the 2014 Corvette is not subject to a gas guzzler tax.